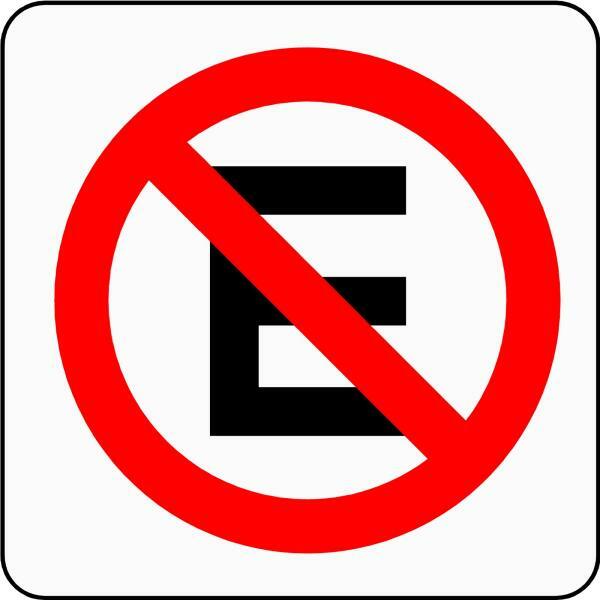 When we were living in Argentina our daughter saw the no parking signs and couldn’t figure out what they meant. In Spanish the phrase is ‘No Estacionarse.’ The no parking sign looks just like ours in English except it has a big E on it instead of a P. She finally determined on her own (and who were we to correct her) that the E with a slash through it meant ‘No Elephants.’ I have no idea how she came up with that, but it did make sense: I never saw an elephant walking around the streets of La Plata. The signs must have been working. We had a great visit with a friend from our days at the Bill Rice Ranch. She has been a neighbor and friend for almost 20 years. 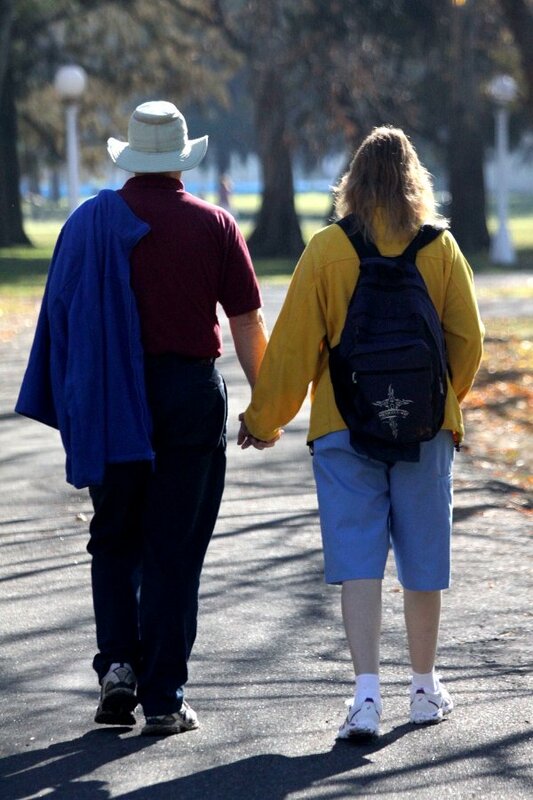 Without going into too many embarrassing details, let’s just say we have been through a lot together. Not the least of which involves lots of gauze, pain and tears. She was here for almost a week and we acted like tourists each day. Wednesday—the day she arrived—we took it easy and talked most of the morning. In the afternoon she and I rode bikes to church and worked on setting up some new microphones she brought with her. Then of course we ended the evening with a church service. 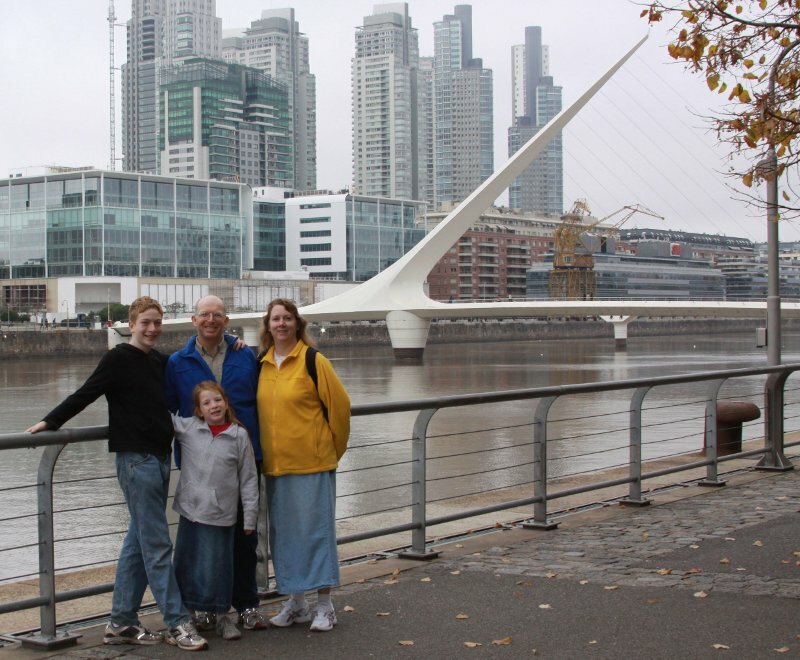 Thursday we went downtown to our city, La Plata and saw the sites. There really isn’t a lot to just walk around and see other than a few old buildings. The city has some nice places to visit, but it would take days to really enjoy the city in the right way. We have an old museum and some beautiful parks. We spent the majority of our time at the Republica de los Niños (the big park near our house) and the old Gothic-style cathedral (the tallest in the Americas). We finished off the evening with a sign language class at church. Friday was our long walk through Buenos Aires. 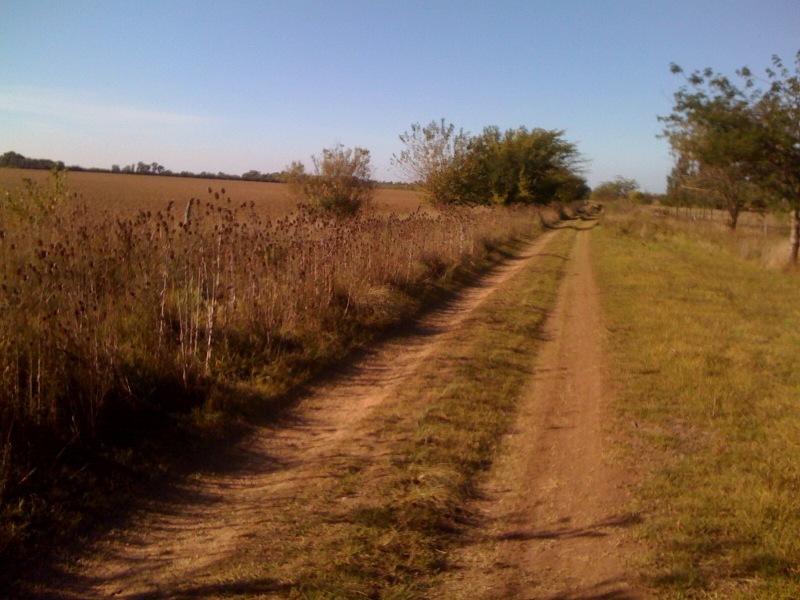 We started with a train trip to the station in BA. Then we rode the subway to the Casa Rosada which is the seat of the executive branch of government in Argentina. We took a walk down to the waterfront and toured a couple of ships which are now turned into museums. Then a stroll down Florida Street. This is a fancy place where people with money go to shop. Mostly tourists. We enjoyed a walk instead of buying anything. 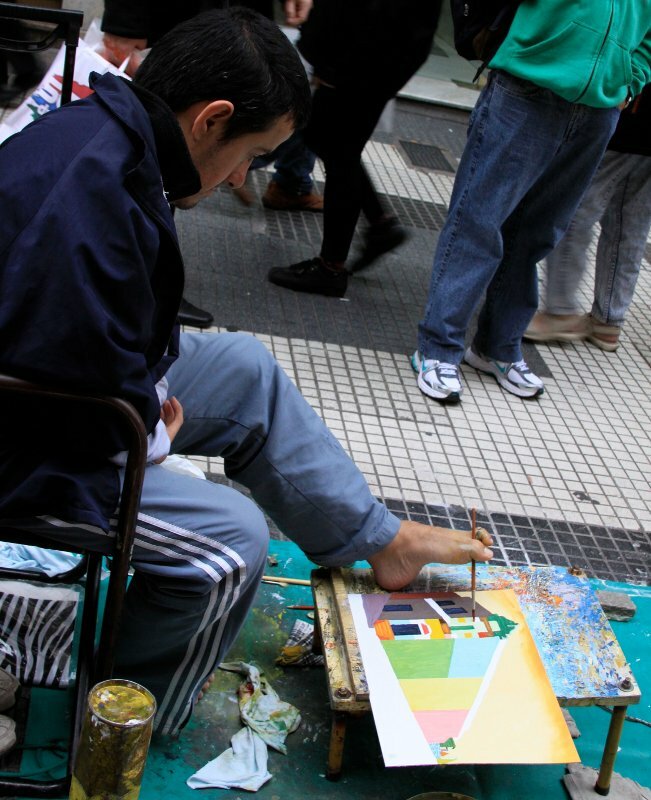 We saw a man painting with his feet, listened to a little music and got rained out of watching some tango music. We rode a nice bus home. We planned to spend much more time in BA, but with the rain we came home and enjoyed a couple of episodes of Shaun the Sheep. Saturday Judy and I went to my sign language class at the deaf association in town. We then spent the afternoon at the hippie market. This is a handcraft market that is mostly run by smelly hippies. That night we had some fellow missionaries over for a meal. Sunday was business as usual. Church in the morning and a long nap in the afternoon. We took a quick trip to another handcraft market before the evening service. Monday was the day Judy had to return home. One final trip downtown to enjoy a final bus ride and look at a couple of souvenirs. I rode with Judy in a taxi to the airport. The ride cost us $65, but got us from our front door to the front door of the airport. Not bad for a 1.5 hour ride. The real adventure began on my trip home from the airport. I wanted to get home as cheaply as possible partly just to see if it was possible to get from the airport to home on public transport with no taxis involved. I took a bus for about 45 minutes to a train station. Bus cost $0.50. When I got to the train the ticket booth said I could get on without a ticket. I got to my next train connection and had to wait 50 minutes for the next train. But, I then rode that on to my house. Total cost was the lone 50 cents I paid for the bus. The downside is that the trip took me 3 hours to get home (twice as long as going), but cost $64.50 less than the trip going. We had a good time talking about old friends and where they are now. We also enjoyed the excuse to take a few days to go see the sites. After she left all our attention got turned to preparing for our church’s missions conference which started a few days later. We took a family trip to Buenos Aires last week to visit the biopark Temaikèn. I am not entirely sure what makes a biopark different than a zoo, but they seem to have taken great care to make sure you don’t think of it as a zoo. However it functions, it looks like just a fancy zoo. On Tuesdays they have 1/2 price entrance which cut the cost from $16 to $8 per adult. 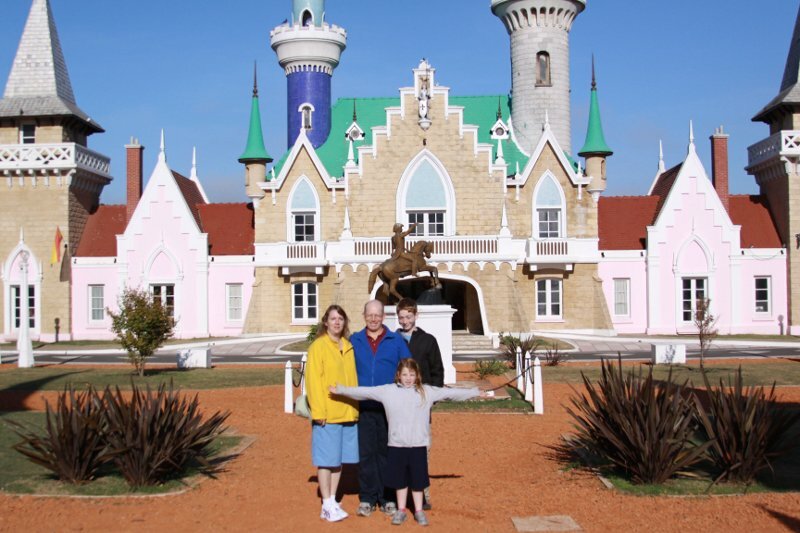 Since the park is a couple of hours away from our house, we decided to combine our trip to the park with a trip we already planned to Buenos Aires. We spent the Monday after Easter with some missionary friends and then went from their house to a hotel in BA. The hotel was very nice and we enjoyed our stay. But, we had to be up early to make it to the park when they opened at 10:00. Even though the park was only one subway and one bus ride away, the bus took over an hour to get there. We enjoyed the subway ride out of town during rush hour when all the morning traffic was going into town. It was fun to watch all the people crammed into the trains going the other direction. Then we only had to wait a few minutes to get the bus to the park. The park is very clean. That is the thing that I think I was most impressed with. Everything seemed to be in good condition. I told someone it was like Disney ran the place. It is not quite that manicured, but almost. They had many of the normal animals you would see in any other zoo, but they seemed to be missing several important ones. There were no lions, giraffes or bears. 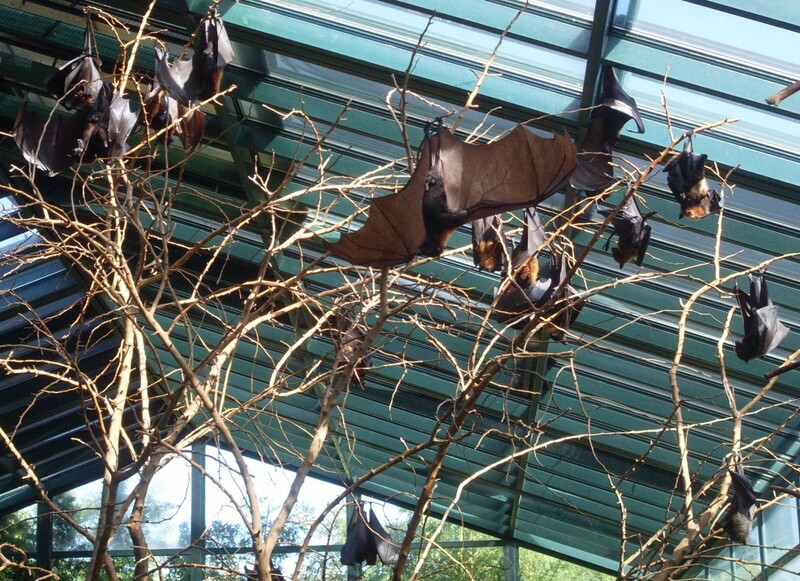 They had large flying foxes (a type of bat) that were gigantic! They have wing spans up to 6′. We were able to go into the cage with them. It took a few minutes to convince our daughter to go in, but she eventually did. They were mostly asleep. There were plenty of play grounds to distract our daughter. One of them was compelling enough that I got in on the fun too. I think we may have had more fun at the playground than the rest of the park. One of the things that really set this park apart from many other zoos is that there were so many cages that we could go in with the different birds. One whole section of the park was huge bird cages. You wouldn’t know you were inside a cage if you didn’t specifically look at the cage above you. Then you would leave one caged area right into another. So they were able to keep the various birds separate from one another, but we did not have to exit the cage and enter the next. Going out of one put you right into the next one. We could get really close to some of the birds. 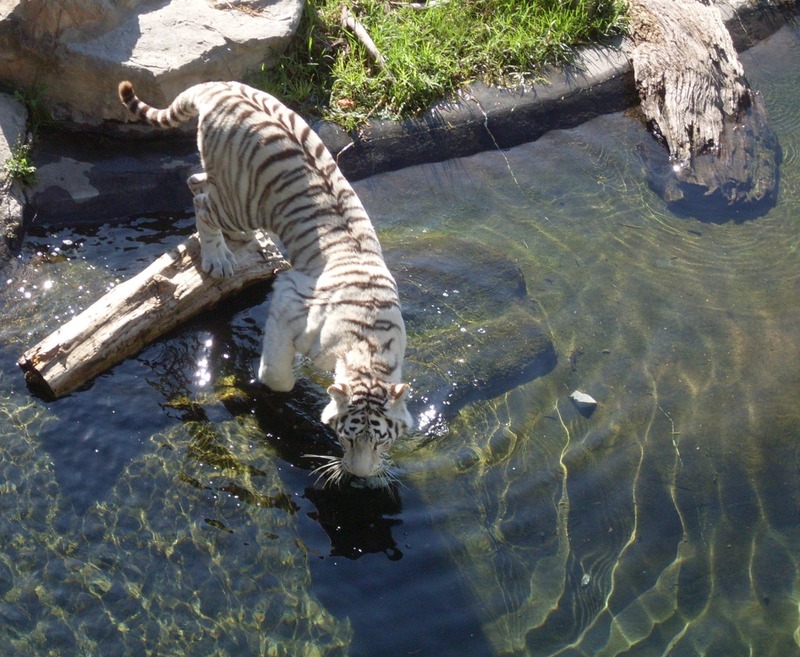 They had a beautiful white bengal tiger that we enjoyed watching. It was as if he understood that people were watching him and he put on a show for us. There was a moat that he could swim in right up to the glass where the people were. He jumped in and played with the water before swimming over to the people. He didn’t run around and do backflips or anything special like that, but just seeing a large cat walk around is impressive. The trip back to BA took another hour. Then we had to ride two subways to get back to the next bus. The first subway was going into town during rush hour when most people wanted to go out. We got to experience the same joy as in the morning where we were on a subway train with few people while the train going the other direction was jam packed. But on our next train we got to experience the sardine can. I have been on packed subway trains before, but this was the worst I have ever experienced. There was no need to hang on to anything, it would have been impossible for anyone to fall. We got on and at every stop moved a little closer to the opposite side of the car. Or, I should say we got shoved to the opposite side of the car. Without our knowing it, the stop we needed to get off at opened up to the “inside” of the tracks. That meant that when the doors opened we didn’t have to fight the crowd to get out. We just had to make sure we did not get trampled when other people got off with us. The rest of the trip home was less eventful. We enjoyed a little nap on our final bus to the house. 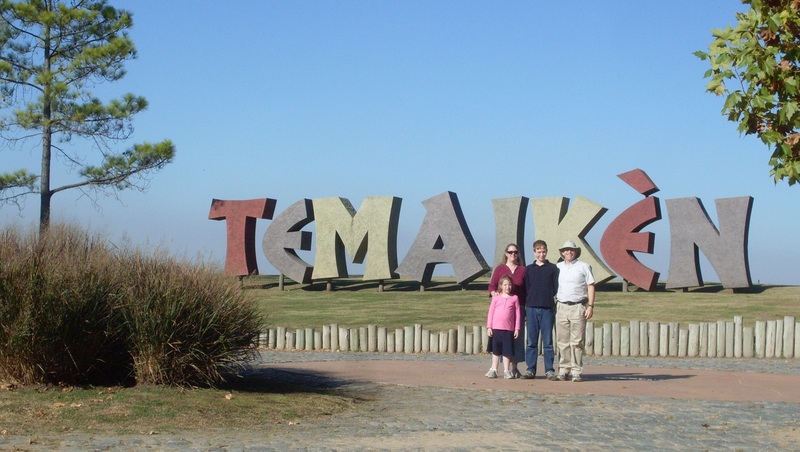 If you are in Buenos Aires and are looking for a great place to spend the day with the family, I can highly recommend Temaikèn. 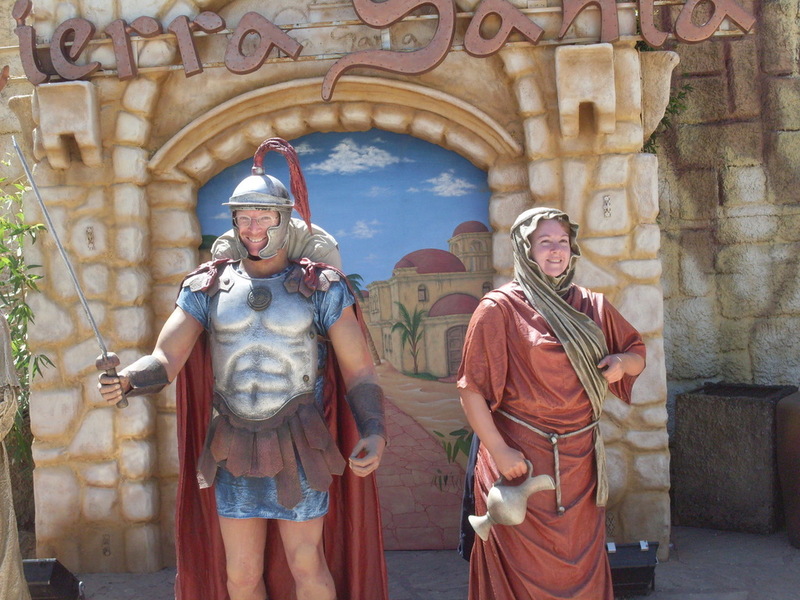 A couple of weeks ago we went to a Bible based theme park in Buenos Aires called Tierra Santa. A friend mentioned it at church and so we decided to jump on a bus and make a day trip. We were there on opening day for their winter hours this season. That means that they were open earlier in the morning and close earlier than they do in the summer. For us that works out well since we didn’t want to be out too late on public transportation. 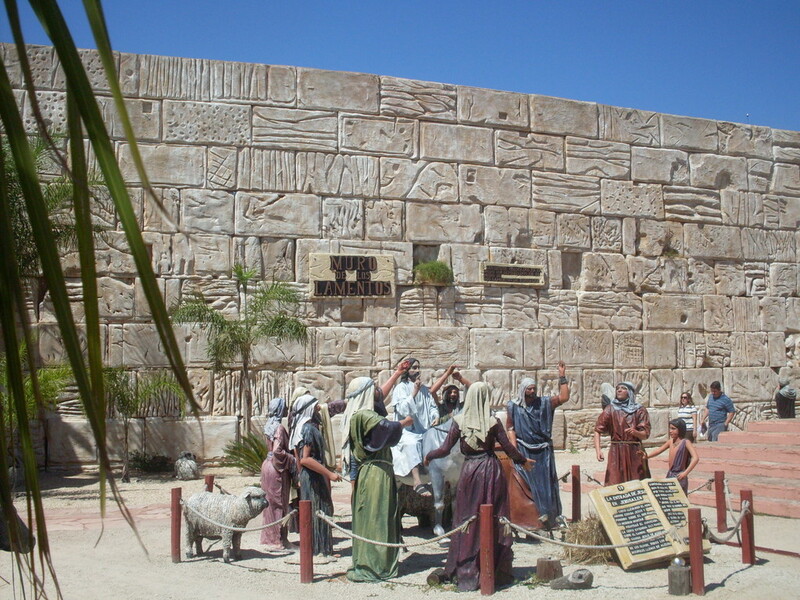 When you first arrive you are hooked up with a tour group by going into a manger scene and watching an animatronics rendition of the nativity. Though having live actors would have been much better, this wasn’t bad. There was a dramatic soundtrack with nice music (they ended the program with the Hallelujah Chorus in English). The lights were done in such a way as to draw your attention to where it needed to be at the moment. The theater itself was inside their “Mt. 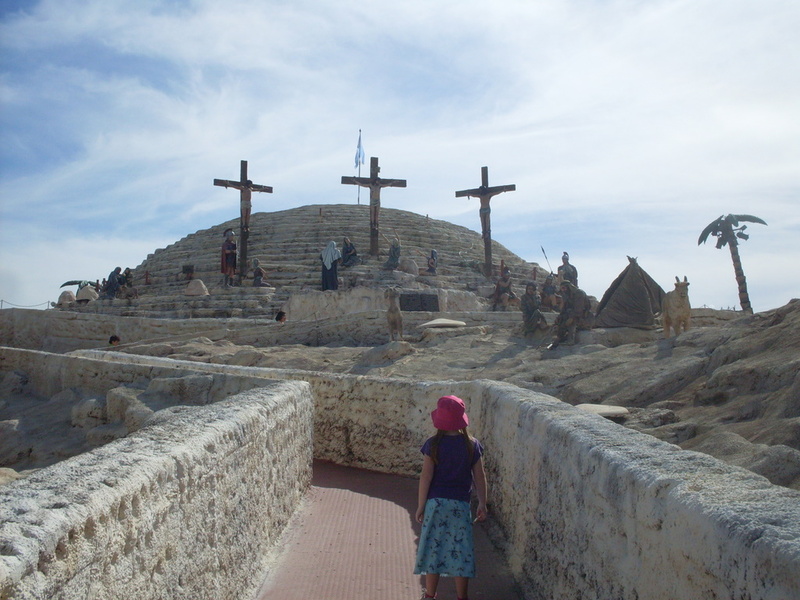 Calvary” so we had to go through a cave entrance to get in. That program runs every 15 or 20 minutes. As soon as you walk in the gate you are instructed to form a group to go into the manger program. This funnels all the visitors into groups that get led through the park. We were given an overview of what we would see through the park by our tour guide (dressed as a Franciscan monk). We stayed together as a group for about 30 minutes as he walked us through the streets of Jerusalem and showed us the highlights. At the end of the tour we were taken in to see another dramatic program which was the scene in the upper room. Again, the program was well done, but I would have preferred live actors. After the upper room scene we were given about an hour to eat lunch and free time to explore the park before we were to meet our guide again. Somehow we missed the group and spent the rest of the day wandering around by ourselves. The guide was to take us to one more show as a group before setting us free. We were able to get in on the rest of the shows throughout the park without any problem. It is not a huge park, but they have maximized their space well. 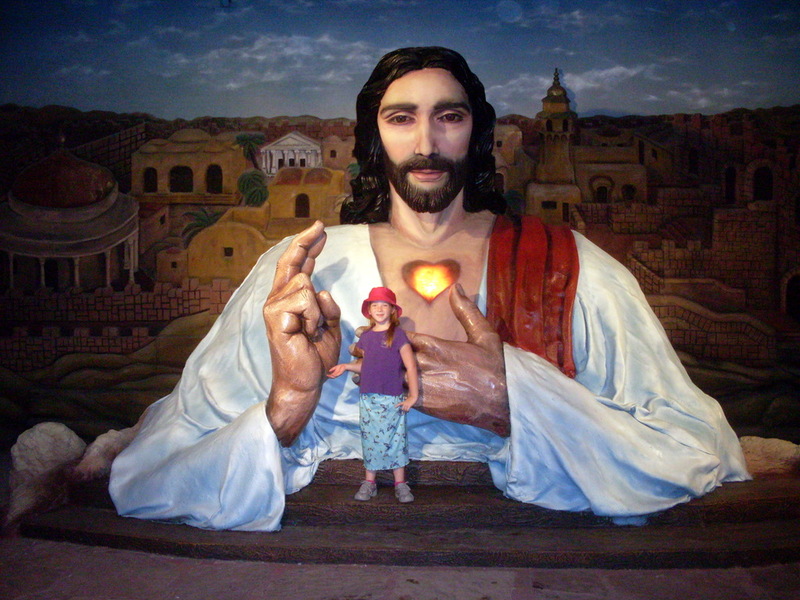 There are something like 35 or 40 different Bible scenes depicted using fiberglass and stucco figures. There were several restaurants which weren’t too badly priced. It has a Catholic slant on things. 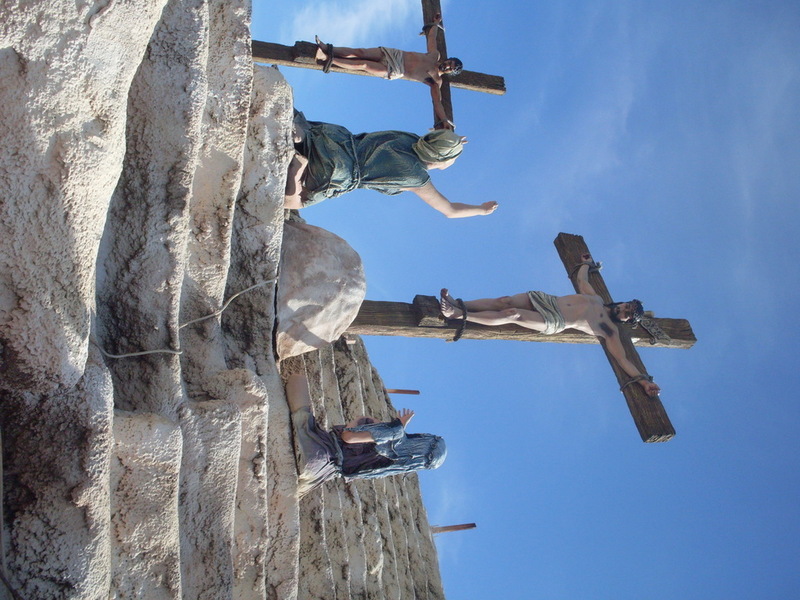 So there were some exhibits and teachings that are not in the Bible at all. There were even some things that were taught from an authoritative position that I did not even know were Catholic teaching. So I learned something new about their beliefs. I just checked the Tierra Santa website and see that the ticket prices have gone up a couple of dollars since we were there a week and a half ago. Currently the cost to get in is $40 Argentine pesos per adult. That is $10 USD. One of my favorite parts of the tours and shows was listening to the narrator. He spoke with a generic Spanish accent (certainly not an Argentine one). But it seemed like he was probably originally from Spain. Even though there was no definition in his voice, he still spoke with a slight Spanish lithp. 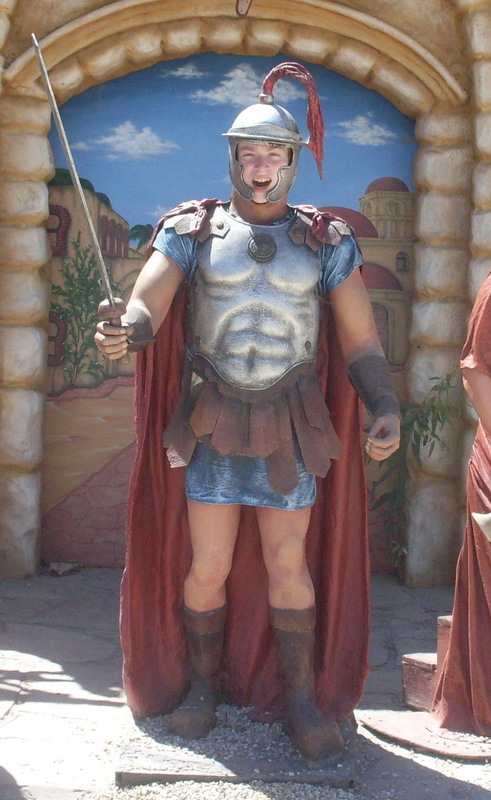 I showed my American pride at one point. Fortunately it was not in front of a group of other people. Just the family knew at the time. There was an exhibit commemorating Martin Luther. I wanted to get over and see that one to see what the Argentines had to say about the man. I was a little surprised to see a short, plump white man in a bath robe. My mind kept thinking of Martin Luther King, Jr. when I read the name on the exhibit map.